A compelling philosophical journey set in London during the Second World War, based on no more than a simple footnote. Based on a tidbit of information that philosopher Ludwig Wittgenstein spent a period pushing trolleys at Guy’s Hospital during the Second World War, writer Ron Elisha weaves a rich narrative that, in just over an hour, explores philosophy, language, literature, religion, and an intriguing relationship between an Austrian ex-professor and an illiterate Cockney amputee. The performance took at Omnibus Theatre, and the red brick former library on the edge of Clapham Common managed to be both quaint and cool, as always. 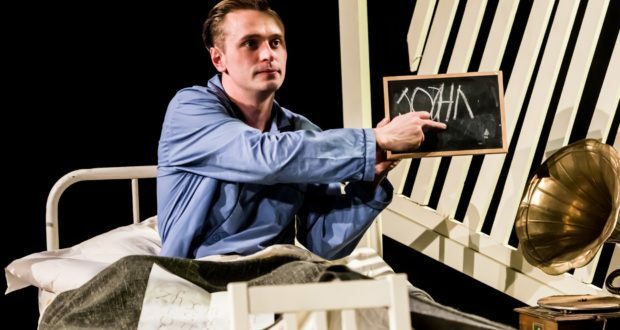 Wittgenstein, played by Richard Stemp, has his creative and hilarious character introduction as he painstakingly irons his shirt, trousers, pants and even socks, with the backlight pouring over his figure. Whether he’s teaching, reading War and Peace aloud – or simply doing the ironing, Stemp delights throughout the performance. 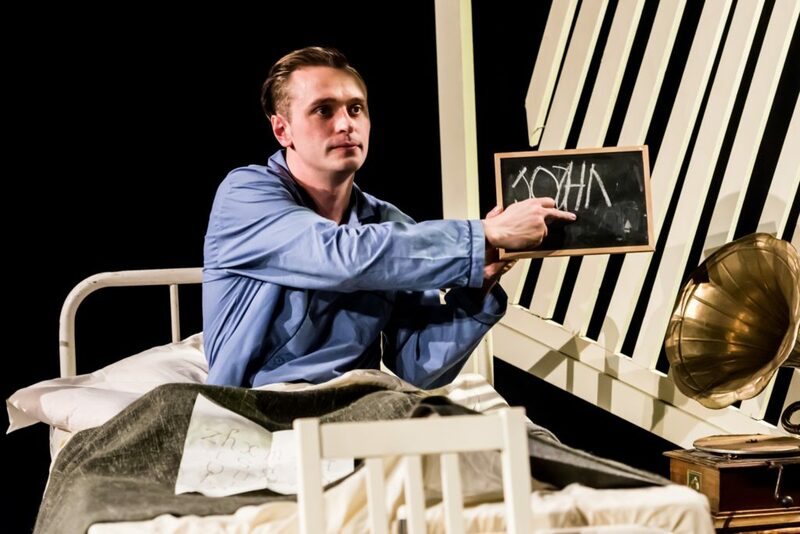 Ben Woodhall’s loveable Cockney John Smith manages to inspire, upset and coax the audience into fits of both laughter and tears, all without leaving the (relative) comfort of his hospital bed. Wittgenstein teaches John to read, while John teaches the philosopher the intricacies of cockney rhyming slang. At no point does the relationship feel contrived; instead, the pair’s developing rapport feels natural and grows organically through their shared experiences. Director Dave Spencer’s efforts shine through on this front. The way in which writer Ron Elisha toys with language allows the characters’ logic to play off against one another, keeps the audience guessing and the pace moving. Wittgenstein’s dense, almost impenetrable logic versus John Smith’s anecdotal evidence means the pair are constantly learning, and the audience with them. The philosopher’s own terminology and writings seep effortlessly into character, plot and dialogue. Setting by Mayou Trikerioti is refreshingly spartan. The abstract wooden backdrop lifts the characters right off the stage, whilst the bashed up metal side table and bed frame do an excellent job of immersing you in a 1940s hospital. The only criticism is that the story dragged in sections that simply restated character qualities the audience had already learned – these could have been cut. That aside, Another Soup stays true to its ethos of creating poignant, compelling and immersive theatre with a tight (and intellectual) finished product.